There is nothing like spending time with a good friend. It’s invigorating and cup-filling. A comfort to know we are not journeying through the mountains and valleys of life alone. Sometimes though, special circumstances can make this more difficult. Parenting and homeschooling are no easy tasks. Parenting and homeschooling special needs children can up the ante even further. Not only do we have the “regular” parenting and homeschooling responsibilities, we often have doctor visits, therapy appointments and other support staff for our children filling our calendars. While some items on our calendar may look different from the typical family, we are more like you than we are different. 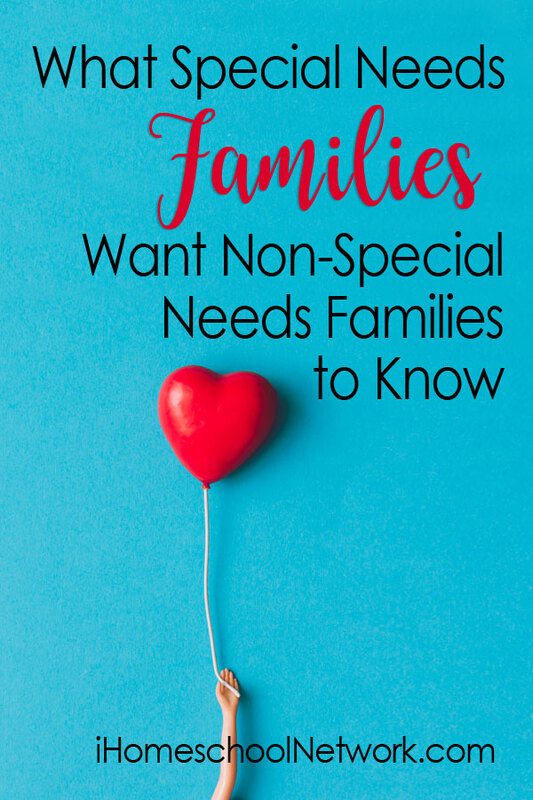 Here are some things that special needs families want all families to know! Life is Hard – We aren’t whiners or complainers, but having a special needs child/children adds an extra layer of chaos. We are often consumed with the care of our families. We are tired. Like dog tired some days because we have to always be “on”. We need to always be alert because our special needs child depends on us so much for basic safety and self-care. Don’t Feel Sorry for Us – Nope! Even though life can be hard, we love our children. Life isn’t all bad, in fact it is pretty darn good most of the time. We All Want the Same Things for Our Kids – Just like you want the best that life has to offer for your children, so do we. Our journey may look different but our children are loved, valued and have skills to offer the community around them. We want the chance for our children to shine too. We Can’t Always Jump to Volunteer – If we are the ones that “never” seem to volunteer to help or participate in activities, please know that it’s not because we are being lazy and don’t want to be bothered. It’s most likely due to child care issues, or the fact that if we add one more activity to our already overflowing plate it will prove disastrous for our family and right now that’s our main focus. How Your Child Treats My Child Speaks Volumes – Be kind. People are afraid of what they don’t know, different can be scary and a bit uncomfortable. Not everyone is lucky enough to grow up with a special needs sibling or have a special needs child. Again, our kids are like yours, they want to be accepted and have relationships with others. It is important to teach (and model!) your children how to treat those who are different. Special needs families, what would you add to the list?